J. COURTNEY SULLIVAN is the New York Times best-selling author of the novels The Engagements, Maine, and Commencement. Maine was named a 2011 Time magazine Best Book of the Year and a Washington Post Notable Book. The Engagements was one of People Magazine’s Top Ten Books of 2013 and an Irish Times Best Book of the Year, and has been translated into seventeen languages. She has contributed to The New York Times Book Review, the Chicago Tribune, New York magazine, Elle, Glamour, Allure, Real Simple, and O: The Oprah Magazine, among many other publications. She lives in Brooklyn, New York. There are memorable characters and stories and then there are fantastic characters and incredibly moving stories brought to life that allow you to fall deep into a book and forget that they are just that. Stories. 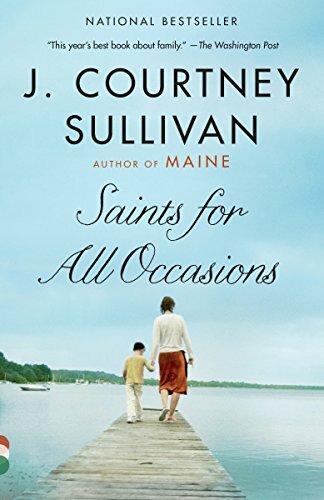 This is what happens when you read J. Courtney Sullivan’s novel SAINTS FOR ALL OCCASIONS. Rich storytelling, fraught with intense struggle, torn between two worlds, young girls who leave their home in Ireland for America, not yet ready for this unknown world that awaits and promises a new life, a better one. Terrified, on their own. Husbands-to-be, still too young to process, away from the comfort of home and family, and all that they know. Sisters torn apart over great love that will change their lives forever. They each take a separate course, never knowing what the other is feeling. This is what secrets can do. A new generation enters with their own set of problems. Of this new world, they are only aware of the present, and a bit of their move from Boston’s Dorchester where their large extended family lives to their new home in the farther away Hull. The sudden move was never explained. Their parents’ past is unknown to them. A family tragedy occurs later as the children are grown and life unfolds before them. Sullivan paints a strong portrait of Irish immigrants, the life and hardship that so many left behind with the hope of better jobs, improved education, while holding on to their beliefs and religion in a new country. What the second generation finds is that they are faced with a different set of troubles, yet some resemble similar predicaments of a previous era. We evolve but there is always difficulty and perhaps, we should not be so quick to dismiss the generation before us. As the grandchild of Irish immigrants and member of a very big Irish family on one side, I thought I would enjoy this book. Mostly, I did. The descriptions of leaving Ireland, crossing the sea, and arriving in America were similar to that of many immigrant stories because the experience was similar for most Irish immigrants. If it were up to me, I would probably still be in Ireland (which I love), because I don’t think I could be as brave as the young girls in the book. The afflictions and struggles of many of the characters are common to those of Irish descent or big families. Culture, religion, and circumstances led to what in hindsight seem like questionable decisions, but, again, they rang true for the era in which they occurred. I was reading the book while on a vacation and found myself eager to get back to it each day. That said, I did not feel that the connection to the title was very strong. Though there was a box of cards with pictures of saints, there was really little reference to them. Both meaning and humor could have been added to the story if there had been a stronger link to the saints. I did not find the ending satisfying. I deeply enjoyed this novel. It reminded me of Matthew Thomas’s “We Are Not Ourselves,” with Alice McDermott influences (Irish immigrants in the states and how they assimilate, etc). Sullivan, an author new to me, takes her time with the various characters in her family narrative, allowing each to have a full story in alternating chapters, beginning in Ireland and covering many years in New England. If you feel like taking your time with a book, you might like this aspect; if you don’t, you might become impatient. It’s quite detailed. I loved the epic feel of it, the way each member of this complicated family gets his or her due. I agree, though, with others who felt that the ending was too abrupt. The entire book seems to be leading up to a final confrontation/reconciliation between its two main protagonists, and I was dying to see how that played out. In fact, it doesn’t play out at all. Sullivan opts for a simple, graceful, woefully inadequate ending to a strong and promising build-up. 4 stars rather than 5 for the disappointing ending. But much gratitude for having discovered a lovely writer.